The central panel of the icon is vibrant and alive with colour. 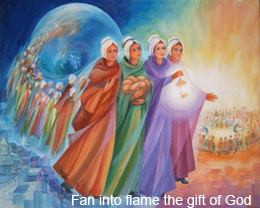 Nano is woman with a passionate love of God symbolised by the heart on fire. In the panel on the top left side we see Christ, whom Nano contemplates in the Eucharist, is the same Christ whom she meets in the poor and "heart speaks to heart". The middle right hand panel shows the four founding sisters standing by the well of living water. The Holy Spirit descends bearing the heart of Christ. A seed is sown, and multiplies, signified by oak leaves which encircle the earth. A sense of energy is created by the Celtic Cross. The spirals capture her love of the God within who compels her to mission. Rays from the sun, illuminate the sisters suggesting the on-going influence of Nano amongst her spiritual family and Her relevance for today and the days that are to come.